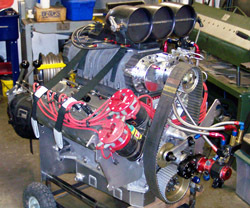 (2) FC Dry Sump Funny Car , Dragsters and Door cars. Billet oil pump shown with single -16AN fitting. Although it only uses 1 line, the larger line feeds both sides externally (like its slightly heavier dual -12AN cousin) but taking less space and fewer possibilities to leak. Also shown with external filter and cooler provisions. 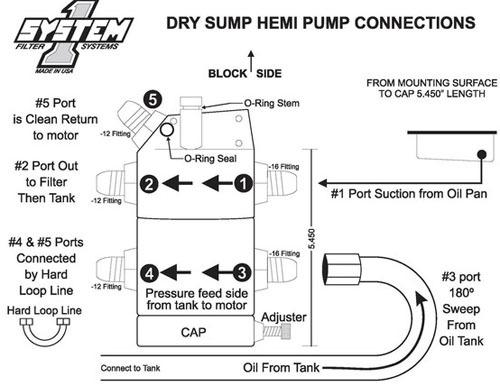 Cast oil pump shown with dual -12AN fitting. One suchion line is on rear of pump, the second is on front in the middle, the top (blue cap) goes to the external filter and cooler provisions the returns to the motor - bottom fitting ( cast pump only). This is the same configuration as the Milidon (original dual pick up). 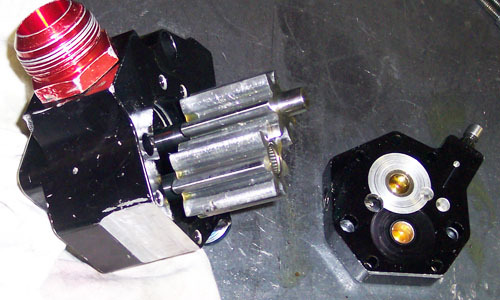 It also upgrades the stock butterfly gear to a reverse of same that has larger cavities per lobe - and more flow. 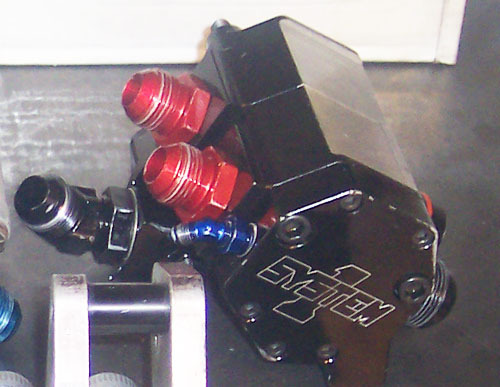 Original (Older cast housing ) used 2 gear sets --> 2 X .75" = 1.5"
Newer cast and all Billet housings have gear set --> 1.375"